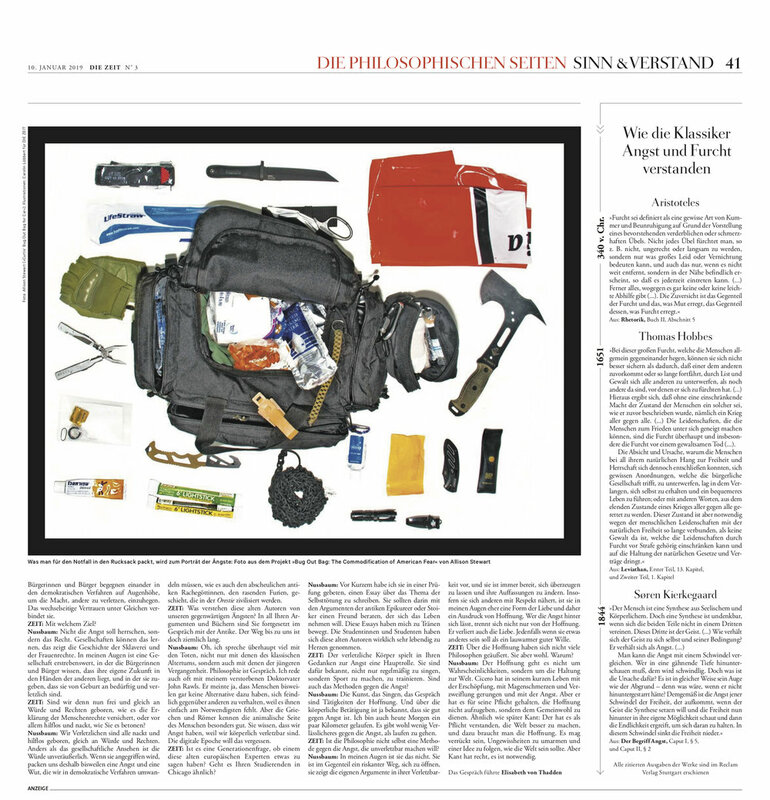 My photograph “Curtis’ Bug Out Bag for Car” accompanies an interview with Martha Nussbaum and Elisabeth Von Thadden on the subject of fear in America: Wie herrscht Angst? On December 1st I participated in Office Hours at the Main Museum. Allison Agsten chose the photo Carole Caroompas as Laskarina Bouboulina to share the wall and on the 8th she threw a party! We had a great time as you can see in these photos by Simeon Soffer. It is such an honor to have my photograph accompany an essay by Rachel Monroe about the commodification of American fear in the latest edition of the New Republic! Magazines are at newsstands everywhere and the article is also online. Resurrecting Matilda is a collaborative project by Los Angeles artists Mary Anna Pomonis and Allison Stewart. Inspired by the stories left out of state adopted textbook curriculum. The Resurrecting Matilda series focuses on the historical erasure of women. The phenomenon was named for the women’s-rights activist Matilda Joslyn Gage, “The Matilda Effect” and refers to the erasure of female scientists who have been left out of textbooks and their accomplishments accredited to their male peers. The photographs explore the timeline of female historical erasures from the Sumerian poet Enheduanna, the world’s first recorded author, to to Laskarina Bouboulina, the first female Navy admiral in history. The female artist participants were asked to identify a heroine they could embody in a portrait re-enactment photo. A special focus was placed on women the artists felt were left out of the historical metanarrative. The artists collaborated to create the costumes and poses exhibited in the series. The artists thus far have chosen widely from a diversity of cultures. Carole Caroompas as Admiral Laskarina Boubolina, (1770-1825) naval commander and heroine of the Greek War of Independence. Laskarina was the first female Navy admiral in history, her ship the Agammemnon, was the largest rebel warship in the Greek War of Independence from the Ottoman Empire. One of the highlights of 2015 was to be included in this powerful show curated by Todd Tubutis. Pete Brook gets to the heart of Conflict and Consequences in his thoughtful review. Dave Miller interviewed me on his radio program Think Out Loud on Oregon Public Broadcasting. We talked about the project and the controversy of including firearms in emergency kits. Listen to the program on their website. I am the second guest. "You can tell a lot about a person by what he’s stuffed into his bug-out bag for the natural disaster everyone knows is coming but few want to think about." Alyssa Coppelman from Wired.com interviewed me about my Bug Out Bag project and the article came out on Monday. You can read the whole article by clicking on the image below. I'm so happy to be participating in Torrance Art Museum's fundraiser on September 12, 2015. 300 artists have contributed artwork, a true testament to how much we appreciate the support and vision of the TAM and it's fearless leader Max Presneill! I spent some time this summer talking to Blaise Mao, the Editor in Chief of the French magazine Usbek & Rica, about my portrait series Bug Out Bags and American identity for a feature in their Summer 2015 issue. Images from the feature are below and you can read Usbek & Rica online here.